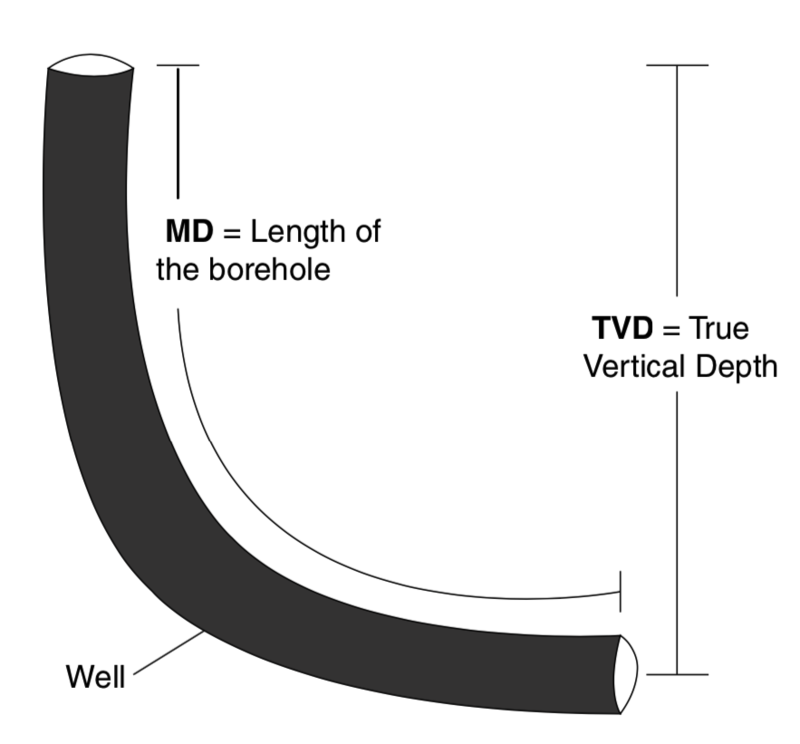 Terminology in the downhole gyro survey tool industry can be confusing. To help bring some clarity, we’ve collated all of the technical terms that the GyroTracer and GyroMaster use, along with their definitions. 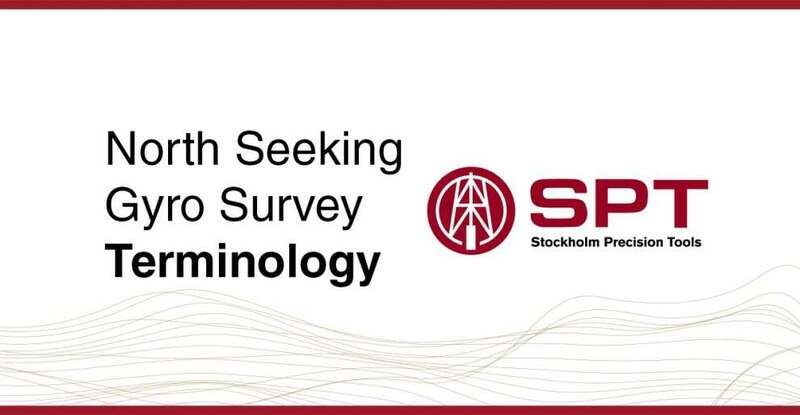 We want you to understand the physical and technical meanings of the different terms that our solid-state north seeking gyro survey tools use in their automated reports. This refers to the total measured length of the well-path. It is necessary to measure all the pipes used during the drilling period. The length is determined at the surface without taking into account the tensional stress of the pipe. As a consequence, the result is that normally this measurement used will be lower than the real path length. Furthermore, this length is not the same as the true vertical depth, except in the case of vertical wells (Illustration 2). Indicates the angular deviation of the well trajectory at any point in reference to the vertical axis. In most vertical wells this is the most important parameter as azimuth projections normally present many errors. Historically, the inclination was calculated via a pendulum mechanism. Nowadays, the inclination is determined by a combination of three accelerometers positioned orthogonally. 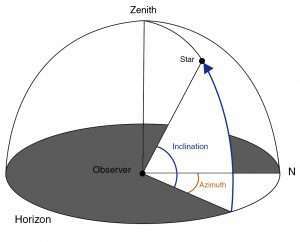 Azimuth indicates the direction of the measured well in reference to true north. To measure this deviation using previous reference methods, the horizontal projection of the well’s direction was the point used. SPT tools use a solid-state gyroscope to find the direction of true north and the azimuth. For data analysis in most vertical wells, it is better to look at the coordinates of the measured point of the well. The measurement of the azimuth on the central meridian of each UTM zone coincides with the actual azimuth. To find this value when the well is not on that meridian, a correction must be applied based on the curvature of the lines of length and the reference taken from the central meridian. This correction is called the convergence angle. This refers to the angular distance of the motor adjustment line with respect to the line passing through the axis of the tool and the highside toolface. For example, a toolface of the instrument that points to the high-side of the well will be 0 degrees, while if it points to the low-side of the well it will show a gravity toolface of 180 degrees. This refers to the toolface deviation in reference to true/geographical north. True vertical depth is the vertical distance that exists between one point of the well-path and the surface point. Normally, this point is on the bottom of the well or is the last point that has been drilled. This measurement allows us to know the hydrostatic pressure produced by the effect of the fluid presence. Illustration 2 shows a schematic representation of the TVD, and Illustration 4 shows another measurement related to sea-level. 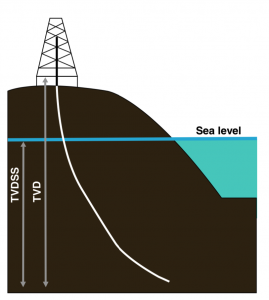 The vertical distance of any point in the earth in relation to sea level. 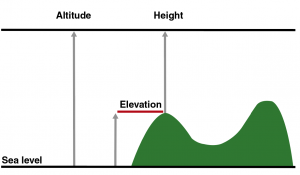 The vertical distance from any point of the well-path trajectory, normally the bottom or the last point that has been drilled, in reference to the sea level (Illustration 4). Projected distances on the horizontal plane that represents the position of any point on the X-axis. Projected distances on the horizontal plane that represents the position of any point on the Y-axis. The vertical section is the horizontal distance of the well-path when it is projected on the vertical plane with a specific azimuth. This is the parameter that measures the changes experimented in azimuth and inclination of the well-path along its length. On some occasions, the surveyor looks for high-values of DLS during a directional drilling operation. This parameter is normally used to identify the trajectory of a well during a measurement to identify possible problems that may arise due to its DLS. 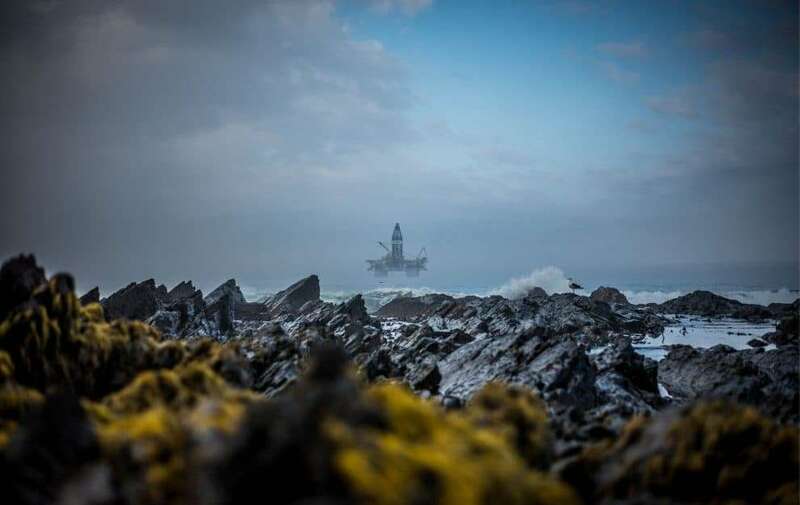 It is also used in oil and gas for the calculation of the necessary bottom engine that is capable of saving the tortuosity of the overall well course. This is the angle referred to by true north that establishes the direction of closure distance. This will point to the position of the vertical projection of the desired point of the well path. Distance from the start of the well to the projected surface point of the well on a horizontal plane (usually the bottom of the well.) Together with the closure direction, this allows for positioning at the hole and moving a certain distance (closure distance) with a direction referenced to the geographical north (closure direction) to locate a point on the surface through which the trajectory of the well passes in the subsoil. The component of the gravitational acceleration that affects the tool. If the tool is perpendicularly exposed to the “G” force, it increases or decreases due to the inclination. It shows the temperature in Celsius at which the north seeking solid-state gyro system is exposed to inside the tool assembly. Table 1 shows the experimentation variation (in meters) by the coordinates of any point of the well due to a percentage error in its azimuth. Calculations are taken in 100 meter well sections and presented for different values of constant inclinations (measured from the vertical). 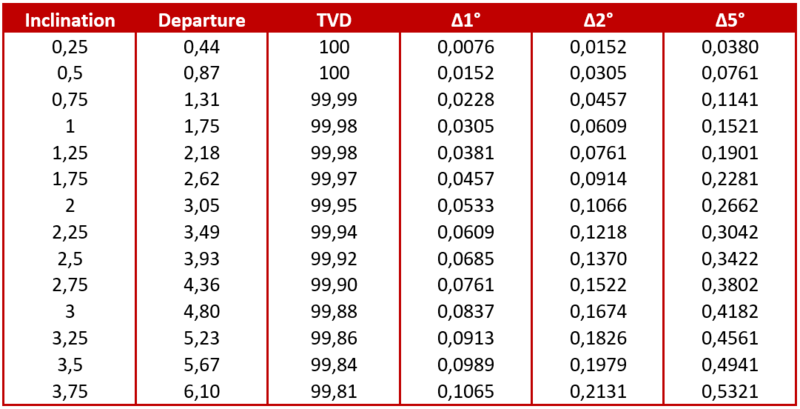 In each point, the table shows inclination, departure (well path horizontal trajectory) and true vertical depth. It also shows the coordinate errors due to the azimuth error of 1, 2 and 5 degrees. In the table, it is observed that as the inclination increases with respect to the vertical, so does the projection and the same happens with the deviation accumulated in coordinates. In addition, it was observed that the maximum value in meters of deviation occurred for the error of 5º in azimuth and with the maximum inclination shown, being approximately half a meter. The relation shown in the table is only applicable in the case of constant propagation of the azimuth error.